This Biobloom After Bath Oil is a blend of Cold Pressed Almond Oil. It contains NO LLP/ Paraffin and is free from all Petrochemicals. It protects the skin against damaging UV rays, helps brighten the skin and is rich in Vitamin E.
BioBloom started with the realization that Nature is the epitome of eternal beauty & is an endeavor to bring to you some natural ways to bring out the best in your skin, naturally! We bring to you Natural & Organic Tips & Products for enhancing the Beauty & health of your skin & hair. Our online tips include simple & easy to use information including some homemade recipes suitable for all ages and skin types.BioBloom started with the realization that Nature is the epitome of eternal beauty & is an endeavor to bring to you some natural ways to bring out the best in your skin, naturally! We bring to you Natural & Organic Tips & Products for enhancing the Beauty & health of your skin & hair. Our online tips include simple & easy to use information including some homemade recipes suitable for all ages and skin types. 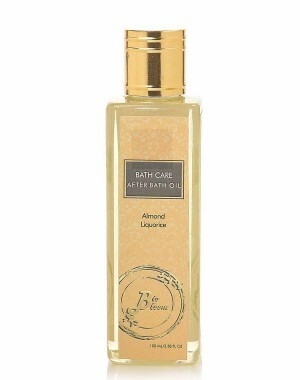 This Biobloom after Bath Oil is a blend of Cold Pressed Almond Oil & Liquorice Essential Oil. This Biobloom Oil contains NO LLP and is free from all Petrochemicals. It protects the skin against damaging UV rays and is rich in Vitamin E which is great for the skin. This Biobloom Oil also helps brighten the skin by breaking down hyper pigmentation.